Villa Alba in Puerto Pollensa in Port De Pollença is a villa with 1 room. 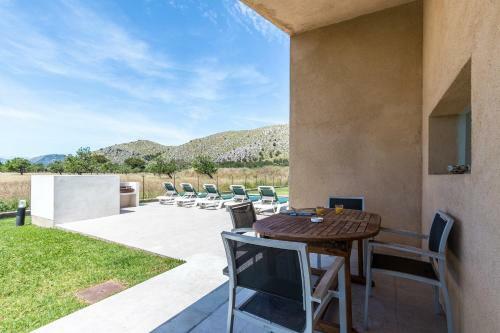 A fantastic modern house in the beautiful countryside of El Vila, between Pollença and the sea at Puerto Pollença. 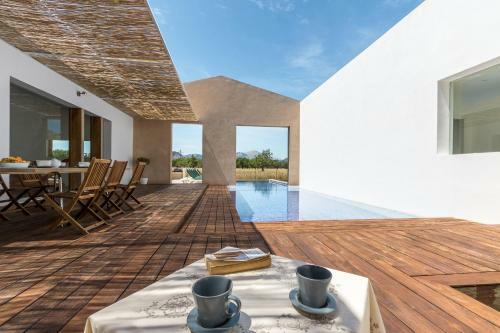 It is furnished to a high standard and full of contemporary design The villa is brilliantly integrated with the landscape around - with natural materials like stone and wood floors, white walls and sparkling lighting. It's designed around a fabulous pool with all the rooms at ground level - with wonderful views of fields, trees and mountains. 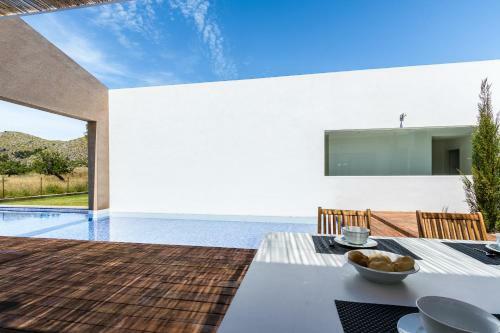 There's a long cool lounge and dining ro...om, flooded with sunlight with floor-to-ceiling doors along one wall opening out onto the pool and decking. The kitchen-diner is a large room with sleek units, high-spec stainless steel appliances including a dishwasher, and French doors looking out across the countryside. There's also a separate utility room. There are five lovely bedrooms. 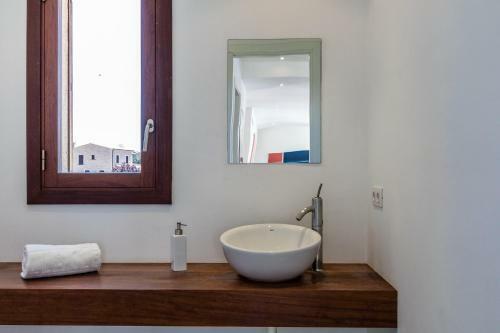 The two double rooms have beautiful views and immaculate new en-suite bathrooms - one with double showers. The three twins have lots of storage space, one has an en-suite shower bathroom, and there's also a family bathroom with a bath and a shower, and a separate toilet bathroom. All rooms in the villa have air-conditioning and heating. 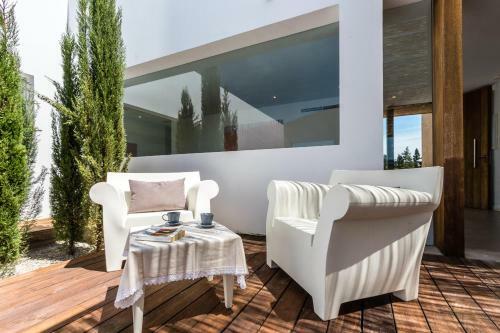 You cannot help but enjoy spending time around the glamorous pool and terrace area as it runs from the central courtyard of the house out into the garden. It's surrounded by decking and gently shaded by stucco walls. The pool and garden have wonderful mountain views and there's also a lawn and a stone sun-terrace. 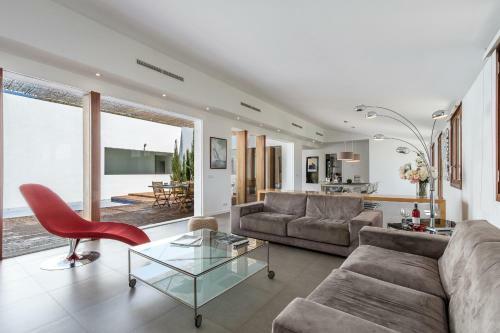 The house is located down a long drive from the main Puerto Pollensa road but still retains privacy. There is now a pedestrianised pavement which leads to Puerto Pollenca from the villa. 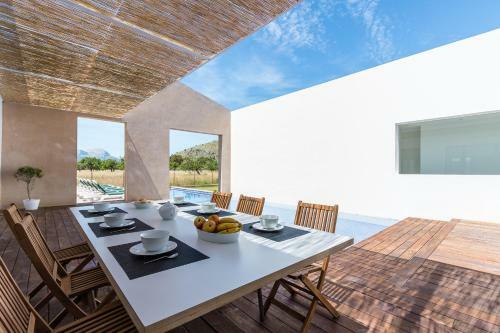 Ca Na Alba is a fantastic contemporary house in a beautiful part of the Mallorcan countryside. It's perfect for large groups and is full of relaxing spaces, designed around the amazing pool, for long lazy days. The sea and beautiful dramatic bay of Puerto Pollença are less than 5 minutes away by car - or a 25-minute walk. And the historic Pollença Old Town is just a 3-minute drive away. 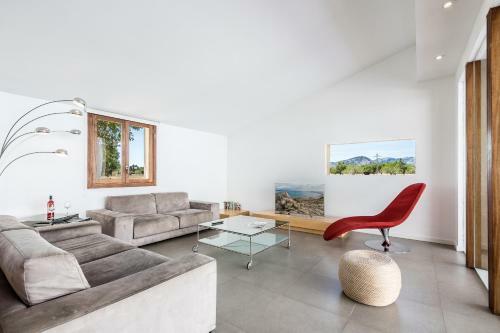 A fantastic modern house in the beautiful countryside of El Vila, between Pollença and the sea at Puerto Pollença. 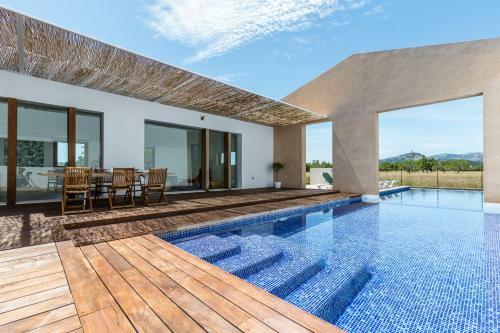 It is furnished to a high standard ...and full of contemporary design The villa is brilliantly integrated with the landscape around - with natural materials like stone and wood floors, white walls and sparkling lighting. It's designed around a fabulous pool with all the rooms at ground level - with wonderful views of fields, trees and mountains. There's a long cool lounge and dining room, flooded with sunlight with floor-to-ceiling doors along one wall opening out onto the pool and decking. The kitchen-diner is a large room with sleek units, high-spec stainless steel appliances including a dishwasher, and French doors looking out across the countryside. There's also a separate utility room. There are five lovely bedrooms. The two double rooms have beautiful views and immaculate new en-suite bathrooms - one with double showers. The three twins have lots of storage space, one has an en-suite shower bathroom, and there's also a family bathroom with a bath and a shower, and a separate toilet bathroom. All rooms in the villa have air-conditioning and heating. 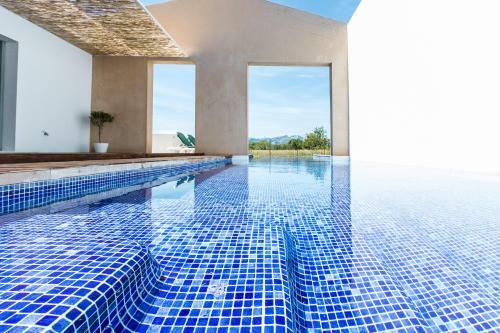 You cannot help but enjoy spending time around the glamorous pool and terrace area as it runs from the central courtyard of the house out into the garden. It's surrounded by decking and gently shaded by stucco walls. The pool and garden have wonderful mountain views and there's also a lawn and a stone sun-terrace. 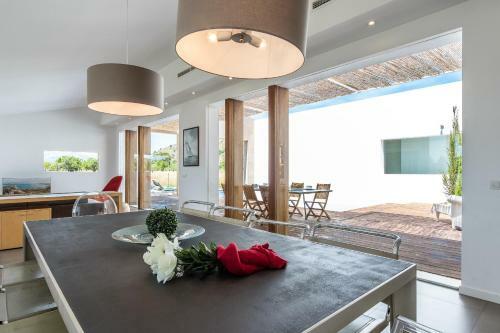 The house is located down a long drive from the main Puerto Pollensa road but still retains privacy. There is now a pedestrianised pavement which leads to Puerto Pollenca from the villa. 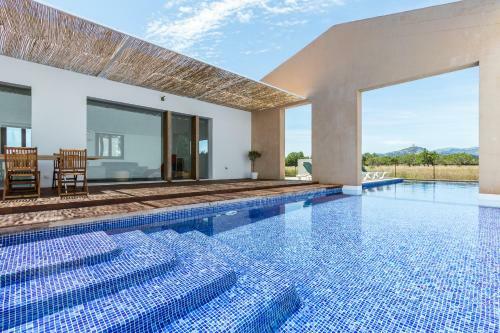 Ca Na Alba is a fantastic contemporary house in a beautiful part of the Mallorcan countryside. It's perfect for large groups and is full of relaxing spaces, designed around the amazing pool, for long lazy days. The sea and beautiful dramatic bay of Puerto Pollença are less than 5 minutes away by car - or a 25-minute walk. And the historic Pollença Old Town is just a 3-minute drive away. Payment before arrival via bank transfer is required. The property will contact you after you book to provide instructions. Please inform Villa Alba in Puerto Pollensa in advance of your expected arrival time. You can use the Special Requests box when booking, or contact the property directly with the contact details provided in your confirmation. This property will not accommodate hen, stag or similar parties.